The vast majority of students are working learners, which means they work and engage in education opportunities at the same time. From internships and work-study to apprenticeships, students have several ways they can engage in work-and-learn opportunities. But, are current work-and-learn models as effective as they could be? The results from our recent research are mixed. 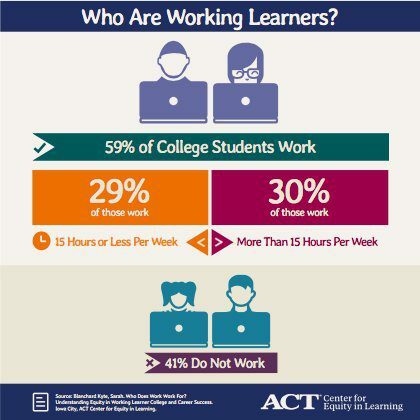 Underserved students who work less than 15 hours per week while attending college have better academic and workforce outcomes compared to students that try to balance longer work hours with their college course loads. This is why it’s so important to modernize and fund programs like Federal Work-Study. In addition to modernizing Federal Work-Study, how else can we innovate and support working and learning so more people are successful academically and in their careers? ACT’s Hope Clark, Ph.D. and Institute for the Future’s Parminder K. Jassal, Ph.D. contemplate this question in their recent piece, Working While Learning: Does the Past Signal the Future? Dive in and learn more about this fascinating topic!